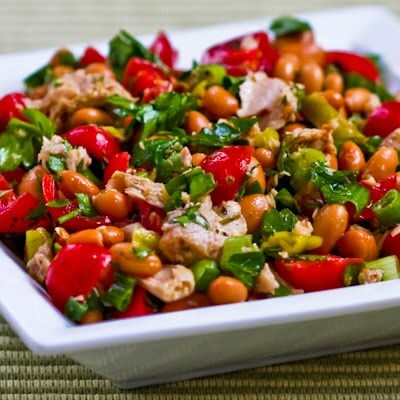 Pinto Bean Salad with Pepperoncini, Tomatoes, and Parsley. It’s July 1, so summer is officially in full swing, and since it’s the first day of the month it’s time to share the round-up of South Beach Diet Phase One recipes I’ve made this month or spotted on other blogs. You probably could have guessed it but this month the round-up is especially heavy on salads, so if it’s salad weather where you are there are some tasty options here. As always, there are some recipes listed that only need minor changes to make them South Beach Diet friendly; those things are noted after the recipe listing. Of course, there are always good Phase One recipes that I don’t manage to spot, so if you’re a food blogger who’s posted something you think might be good for Phase One, see after the recipe links for how to submit it. Asparagus Salad with Pesto and Parmesan from Cook Sister! Did I Miss Your Phase One Recipe? Phase one menus for the South Beach Diet focus on lean meats, seafood, eggs, dried beans, soy products, low-fat dairy products, nuts and seeds, and most vegetables. Phase one doesn’t permit fruit, alcohol, bread, rice, pasta, potatoes, sugar, or any foods high in saturated fat. Obviously I miss lots of phase one recipes, so if you’re a food blogger who posted a recipe this month that you think would be approved for phase one, please feel free to e-mail me the link at kalynskitchen (at) comcast (dot) net. I’ll take a look, and if the recipe is phase-one friendly, I’ll add it to next months roundup. (Please don’t leave recipe links in the comments. They will not be published. Thanks for the link! What an incredible list of summer-time light recipes! I will refer back to this for sure. Thanks for the shout-out Kalyn! Your site just keeps getting better and better. Any time I get stuck for inspiration for healthy meals I come back to your Kitchen … it always gets me pointed in the right direction! Amanda, I buy low fat cheese when I can find it, but for some types when I can't find low fat, I just use it in moderation. I don't think I've seen low-fat Parmesan but goat cheese has only 5 grams of fat per ounce. Hi! My boyfriend and I are starting the South Beach Diet tomorrow. I love your blog! Thank you! The only thing I was wondering is about the recipes that use cheese. Have you been able to find low-fat or fat free goat cheese, parmesean, etc. for the Phase One recipes you have posted? Or, do you use the regular cheeses? Kalyn, thank you so much for the wealth of recipes and food ideas you provide! I seem to be on and off the South Beach plan, but am mostly just trying to focus on healthy preparation and quality ingredients… and savoring the foods I choose to eat! Your blog is a real asset – keep up the great work! Thanks for the mention – I love your top pick salad! And so many good recipes to look at…. I'm starving! Thanks for the shout out, Kalyn! Thanks for putting them together. I am planning to go back on phase 1 to reach my goal weight faster. This will definitely help me. Another great write-up. Thanks for including me. I love your new favicon. Thanks for the mention! That asparagus and pesto salad is truly remarkably good. And easy 🙂 Some wonderful recipes for summer to try here – thanks! I need to buckle down and get back to how I ate while living out there. Thanks for this list! And, thanks for linking to my Pate! There are so many great salad ideas this month. I'll definitely ba adding some to my summer menus. I recently found your blog and I just want to say Thank you!!! I just started South Beach Tuesday and need ideas. I love all the information you have here!!! Nice round up! Some great recipes there, I'll take a look and see if I can find anything qualifies for phase 1. Thanks!